Pros: Conveys in-depth information in “bite size” proportions. Highly engaging and presented in a high-quality format with beautiful illustrations. Cons: Readers may find it a little too dense if attempted in one sitting – it should be considered as more of a reference book. 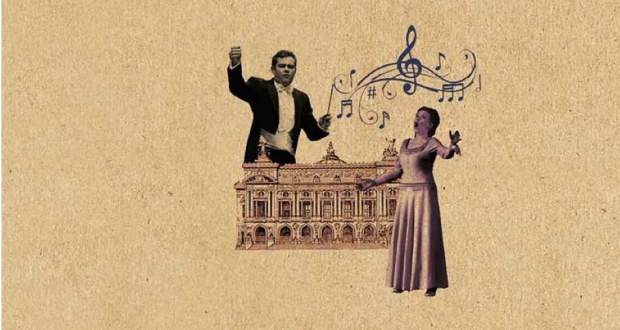 A great introduction to opera, transforming a subject that’s often considered inaccessible into an easier-to-digest format with lively, in-depth writing. 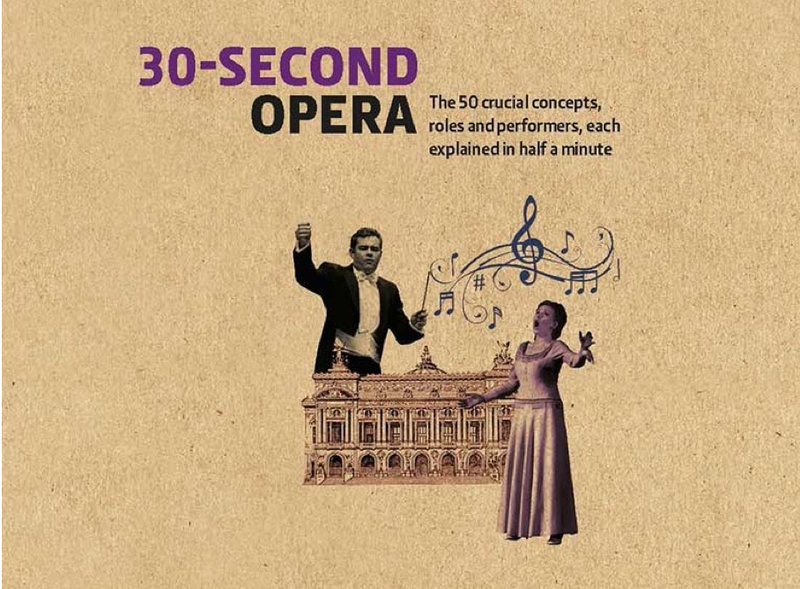 As a near-novice in the world of opera (I’m ashamed to say I’ve seen a mere one opera in 26 years), I can’t deny that I was little apprehensive when met with the 160 opera-filled pages of 30-Second Opera – “The 50 crucial concepts, roles and performers, each explained in half a minute”. This is part of a new initiative from Ivy Press to transform broad, seemingly difficult subjects into smaller, bite-sized chunks that can be consumed within 30 seconds. The first thing I noticed upon receiving the book was how beautiful it is. Deceptively plain on the outside with its brown cover, the inside is much better fitted to its subject matter with each glossy page of text paired up with a beautiful high quality illustration on the next. It seems only fitting that a medium so associated with dramatics and aesthetics is represented by such beautiful imagery. In hindsight, I think I probably didn’t read 30-Second Opera the way it was intended; its “bitesize” format makes it difficult to read in one sitting and I think it would lend itself better to being used as a reference book. I’d even put forward that it would be a great resource for those studying music or music history at school. The entries can feel quite dense when read in quick succession while when consulted separately they form the perfect amount of information to help you enjoy opera without overloading your brain with complicated phrases and terms. The book is split into various sections (including Genre, Building Blocks and Voices), each of which opens with a glossary and then goes into greater detail about specific elements of the subject. The sections are broken up with colourful, more detailed biographies of popular figures from opera. The writing itself is really knowledgeable and engaging, demonstrating the breadth of knowledge and the passion of its authors…and ensuring that the reader stays entertained in the process. I think the best recommendation I can give for this book is how enthused it’s made me to see opera productions in future. As soon as I finished it I wanted to listen to the likes of Enrico Caruso and Joyce DiDonato, and I didn’t even have any idea that Benjamin Britten had adapted The Turn of the Screw – a very exciting prospect for a gothic literature fan! In the introduction to 30-Second Opera Kasper Holten explains how this book is meant to address the issue of introducing opera without losing out on the suspense associated with the genre by giving away significant storylines. Although I wouldn’t recommend reading this book in one sitting, I do think this makes a brilliant introduction to opera and a great companion for those who need to become well-versed in the art form in a short period of time. It only took me about an hour to read the whole book but I already feel much more well-read on the subject! And I’ll certainly be seeing more opera in future thanks to Hugo Shirley and his team. Author: Edited by Hugo Shirley with contributions from numerous authors. Publication Date: Out Now. £14.99. Blogger and copywriter. An eager bookworm, Natalie's passion for theatre stems from her love of Shakespeare, whom she hopes actually resembled Joseph Fiennes a little bit. Having always been a bit of a musical snob, it wasn't until she'd been writing about them for a year that she finally thought it was about time she actually saw one. She quickly fell in love with The Phantom of the Opera, which has proved to be unrelenting in its hold on her since. Balancing her love of Renaissance drama with her idolisation of Andrew Lloyd Webber isn't easy to justify but she's still holding her breath for a Hamlet musical!